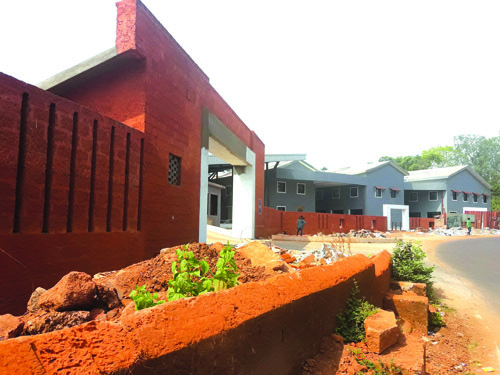 The Pernem bus stand, which was inaugurated in December last year, is yet to be thrown open to the public. It’s been months and the bus stand construction stands incomplete. Located in the heart of Pernem, the bus stand has been a long pending demand for many years. A visit to the site one can witness private and other buses being parked along the roadside near Bhagwati Temple, Pernem, which is a cross road junction leading to Maharashtra via Patradevi, Keri, Morjim and Mapusa. With no bus stand, the drivers park their buses for almost 10 to 15 minutes on the roadside causing inconvenience to other vehicles. With no traffic signals and in the absence of traffic police, the area witnesses traffic congestion and minor accidents especially during school and office hours. To add to this, parking is another major problem which the government had assured to provide a solution. Besides buses, the incomplete bus stand has a provision for a taxi stand and a parking space for 60 four-wheelers and 100 two-wheelers. After its inauguration, the people of Pernem had heaved a sigh of relief but have been kept waiting for its completion. The people are forced to wait for hours to board the buses as the current space is being used by operators to park their buses. The project, which is being constructed at an estimated cost of Rs 21.5 crore, is the state-of-the- art project having an area of 7.770 sq mts with 10 alighting and departing bays, six waiting bays, two repair bays, single entry & single exit point and a toll booth. Sources informed that recently the bus stand has been inaugurated only for government vehicles for parking purpose. Sources further stated that the three shops located outside the bus stand pose obstruction to the smooth movement of vehicles. It is learnt that these shops are located in a private property and the owners are claiming for compensation or rehabilitation. “What is the use of the bus stand if it is not opened for the public despite its inauguration? Bus stand is there but public cannot use it. Government took publicity of constructing the building but could not give it to the public even after so many months”, complained Roshan Rodrigues, a local. When contacted, Pernem MLA Babu Azgaonkar said, “Just for sake of publicity, the previous MLA inaugurated this project when it was not even ready. This project is still incomplete. There are some problems which need to be solved and due to which we cannot thrown open this bus stand to the public. Soon I will be meeting the concerned officials and a inspection of the site will be held. Only then the problem will be solved and project will be thrown open to the public”.